In the early days of hang gliding, hang gliders were the original free flyers, simple wings developed from pioneering NASA technology of the 60s and 70s. 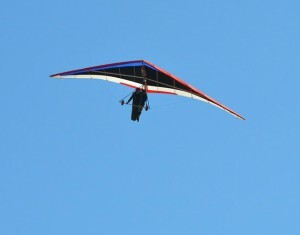 Modern hang glider pilots launch either from winches, behind microlights or from hills, enjoying long flights over great distances. Hang gliders climb better, can fly faster, and probably have the best glide characteristics of all free flight disciplines. Hang gliding is an air based sport in which the pilot flies a light, non-motorized craft called a hang glider which is launched by manpower. Nowadays, hang gliders utilise the latest technological designs and are generally made of an aluminium alloy or composite frame covered with synthetic sailcloth forming a wing. The pilot is fastened into a harness suspended from the airframe, and manages to control the craft by shifting body weight in opposition to a control frame. With its regular and fairly constant coastal sea breezes, for which it has long been well known, Zandvoort is an excellent place to practice the demanding but thrilling sport of hang gliding and in the summer, many holidaymakers on Zandvoort beach in the summer or autumn will be treated to a display of this exhilarating sport.